Take a trip back in time . . . The Year is 1585. You are in Tilbury, England. The Spanish Armada is coming to invade England. The English troops are here to meet them. Queen Elizabeth is on her way. Her Knights are ready to do battle for England. It all happens on July 20 & 21. Welcome to the age of legendary characters like William Shakespeare, Sir Walter Raleigh, Sir Francis Drake and a host of famous Dukes, Earls, Lords, and Ladies. You’ll see them here in all their finery. Join us on July 20 & 21 in Laguna Lake Park. Relax on a shady hay bale and watch riotous stage plays and hilarious comedy acts on four stages throughout the village. You’ll see authentic Elizabethan dancing, plays, singing, a falconry show, magic, juggling and crazy buffoonery. Throughout the village, you’ll see living history demonstrations. The entertainment is amazing and continuous throughout the day. It doesn’t just happen on the stages, it is in the streets and throughout the village at every turn. This is full on hand-to-hand combat. 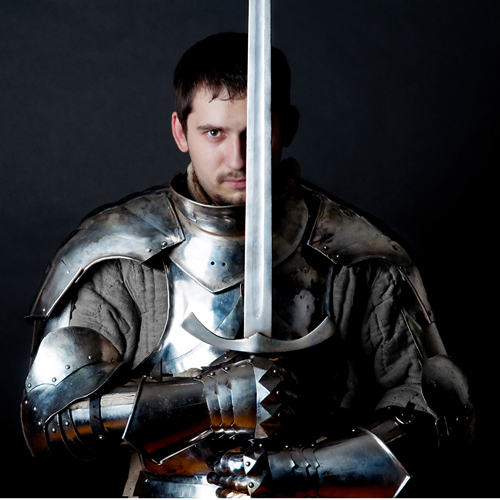 These knights have a brand new series on The History Channel and they are bringing their amazing demonstration of combat to the Central Coast. You'll definitely want to see this. You’ll be delighted by over 50 of the finest craftsmen selling unique arts, crafts, and sundry goods. From hand-thrown pottery to drinking vessels, there is something for every taste and budget. Gentlemen always enjoy shopping from the sword and leather merchants, while ladies can’t resist the array of fine clothing and jewelry. You can even have your hair braided into the most beautiful designs and get a henna tattoo. You’re sure to find a special gift for yourself and someone else. You'll want to indulge in the wide array of delicious food and drink available. Food will include the traditional roasted turkey legs along with meat pies, roasted sausages, sandwiches, and Greek, English, Scottish and Asian foods. Sweets include ice cream, pastries and more. Quench your thirst with freshly squeezed lemonade, iced teas and of course, the Queen’s own beer, ale, wine, cider and honey mead. The festival will transport you back to the 16th century. 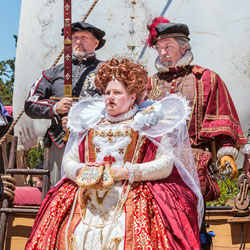 Both days are set in the reign of Queen Elizabeth in England, but on Sunday the emphasis shifts to pirates, and vendors will bring out pirate wares and dress as pirates. Both days are a magical experience. The entertainment schedule is the same both days. There is something for all ages. We didn’t forget the youngsters, who will enjoy face painting, music, a magic show and games just for them. Sunday is Pirate Day and the young ones can join in the treasure hunt. Dress the kids up for the very popular children’s costume contest where everyone gets something and the winners take away top prizes. It happens both days at 1:30 PM. Parking is $8 per carload. We encourage carpooling. If you have five or more people in your car, the fee drops to $5.00. NO Pets, please. This is a non-smoking event. Please visit our website to learn more about the event.